From the newly designed KS tubular series of embroidery machines from the world’s leading manufacturer SWF through to the brand-new Print Wizard Ghost transfer printing systems aimed at business start-ups, stay at home parents and students alike. SWF is a world-renowned name in the international embroidery market owing to the integration of leading technologies. These high quality and competitively priced machines boast outstanding production capability and excellent quality. The new KS series, with a sewing speed of 1,200spm, features a wider screen to make it easier for the user to see and use, while accurate positioning and increased colour change speed is achievable due to advanced design mechanisms. 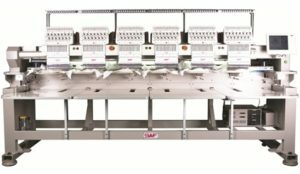 These machines also offer a reduction in noise, vibration and power consumption, making this range of embroidery machine an unbeatable buy for those requiring serious production at a reasonable price. Moving away from embroidery but staying with decoration, YES Ltd is now the UK distributor of Print Wizard Ghost, bringing transfer printing into a new era of affordability, able to reach out to a much wider market. 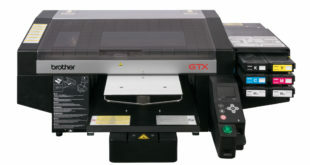 The new low cost and user-friendly Print Wizard Ghost transfer printing system has virtually no limitations to decorating light and dark garments or hard surfaces, and requires no pre-treatment or weeding. This self-weeding transfer system prints onto dark textiles using a low processing temperature, onto light, pastel and dark garments such as cotton, synthetics, nylon and wool, and onto hard surfaces such as plastic, metal and wood. This is a fast, reliable and cost-effective way of offering printed items and garments for business start-ups, especially where the order is for a small quantity. Visitors to P&P LIVE! in January will be able to see these two pieces of equipment in action for the first time.